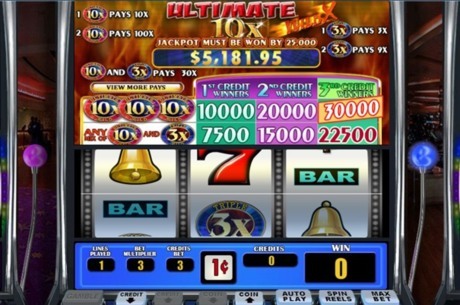 Ultimate 10x is a 3-reel, one pay-line progressive slot machine that is connected to 7 WGS (Vegas Technology) powered online casinos. With a bet of just $0.25 per spin you can win the progressive jackpot. Coin values start at 1c and you can bet 1, 2 or 3 coins per spin - up to a maximum of $30.00. Symbols are made up of classic Cherries, Sevens and Bars. 3 coin bet = Win 1,500 coin value. Jackpot symbol on 1, 2 or 3 coin bets wins the jackpot shown. Minimum qualifying bet for jackpot win is 25 cents per spin.